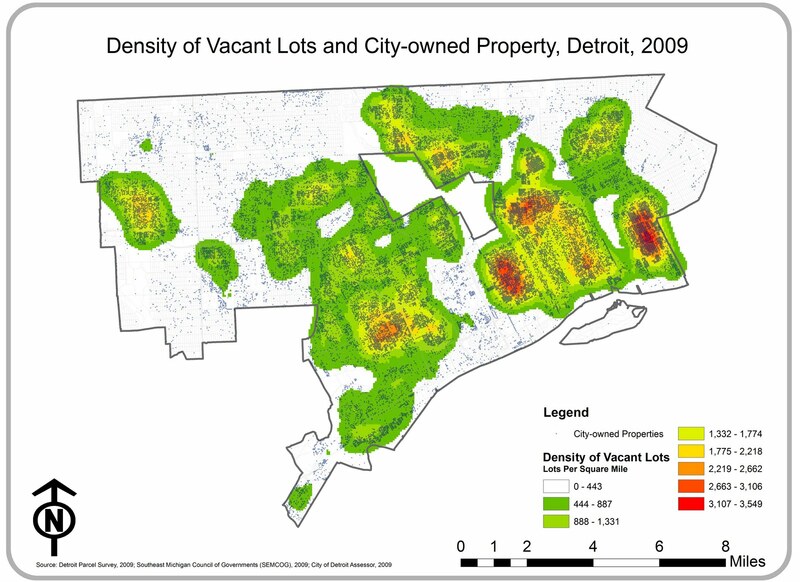 Shrinking cities, such as Detroit, Michigan, present challenging obstacles for urban planners, city council members, and residents, because they do not shrink uniformly from the perimeter inward. Instead, we are left with gaps in the urban fabric; vacant land and empty lots expanding like dark matter in our city and urban neighborhoods. Urban farming can provide a sustainable intervention to Detroit’s issues of abandonment and access, but is it a long-term solution? Detroit has a rich history of farming. From the Mound Builders to (Mayor Hazen) Pingree’s Potato Patches, to Detroit’s Eastern Market established in 1891. However, it is in the last decade that environmental non-profits and farming co-ops have begun to infuse the city with new life – and greener thumbs. Capuchin Soup Kitchen’s Earthworks, Ferguson Academy for Young Women, Brother Nature Produce, and Detroit Mural Factory are just some of the organizations realizing the mission of The Greening of Detroit, Detroit Agricultural Network, and SEED Wayne. While Grown in Detroit recognizes and supports the industrious efforts of urban farmers in Detroit, Highland Park, and Hamtramck. Individuals, communities, and organizations all over the city are making productive use of the vacant land. Even Compuware has joined the movement, utilizing landscape design to transform the old Lafayette Building site into a community garden at the heart of the city. Urban farming is a positive intervention for urban shrinkage. In addition to improving environmental health, it provides educational opportunities and ensures access to fresh food. While the development remains primarily grassroots and small business, the buzz from websites and social media has gained Detroit national attention. The future of Detroit’s urban farming community is uncertain. Despite attempts to purchase, many individuals do not own the lots they farm. The City Planning Commission’s efforts to legitimize urban agriculture stalled after running into the Michigan Right to Farm Act, while the Hantz Farms Detroit’s proposal for the 70-acre world’s largest urban farm presents its own threat to the sustainability of community gardens. Does Detroit need a master plan? Or does it require policy changes that support the organic re-growth already in place? Credits: Images and data linked to the sources.